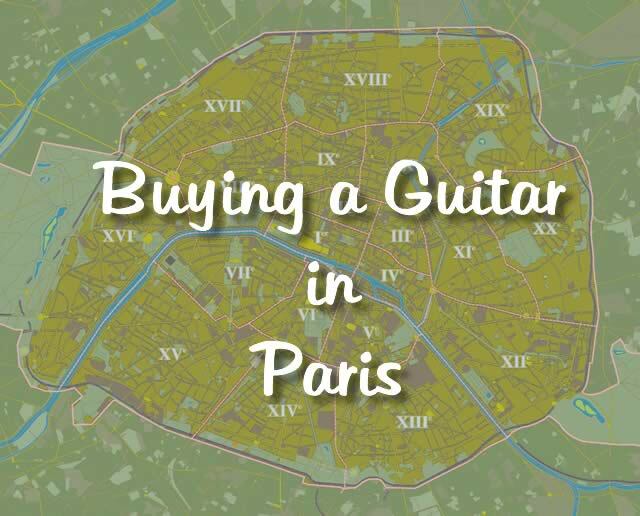 Paris boasts a number of specialist guitar stores. They are mostly grouped together in one area on Rue de Douai and Rue Victor Massé, one block down the hill from métro Pigalle, with a few other stores on neighbouring streets. Here you will find stores that specialise in electric and/or acoustic guitars, bass guitars, left-handed instruments, used and vintage instruments, spare parts and accessories, amplifiers and effects. There are a also few large music stores in Paris: Woodbrass (métro Porte de Pantin); Paul Beuscher (métro Bastille); and Star’s Music (métro Pigalle). These stores have a large selection of all manner of instruments and equipment, from guitars, basses, and ukuleles, to keyboards, drums and percussion, and in some cases brass and woodwind, home studio, DJ and PA equipment. (Note: Musikia, on Blvd Sébastopol, permanently closed its doors in January 2016). For classical string instruments, Rue de Rome (near métros Rome, Europe, Saint Lazare) is famous the world over. There are only a few guitar stores to be found here but they are good places to visit if you want a quality hand made classical guitar. They will also stock a smaller choice of steel-string acoustic guitars. There are few other stores dotted around Paris. You can find them through the Pages Jaunes (French Yellow Pages). This should be an easy question to answer – buy the guitar that best suits the type of music you want to play. If that question can’t be easily answered, look to your favourite artists for inspiration. Inspiration is important and this should be your goal when choosing your first instrument. If the guitar does not inspire you to pick it up, you won’t play it. First, remember that no matter what type of guitar you buy, most guitars are tuned and strung the same way. Technique and playing style may differ somewhat but all the notes, chords, and scales are in the same place and all the theory and knowledge you acquire on one instrument applies equally to another. No one kind of guitar is more difficult to play or learn on than any other. For most styles of music a steel-string acoustic guitar is a versatile choice. It is an excellent choice for a lot of pop, folk, rock, country, blues, and even jazz. But there is no rule that says everyone should start on an acoustic guitar. If classical guitar or flamenco is your thing, then the decision is easy – you really do need to buy a nylon string classical or flamenco guitar. (Note – I am not a classical guitar teacher). Of course a classical nylon string guitar need not be limited to playing classical or flamenco music. Many people prefer a classical guitar for folk/pop/jazz. I should point out that some people start learning the guitar with classical guitar in the belief that it’s easier or initially less painful in the finger tips than steel-strung guitars. However, I don’t really think that’s true and classical guitars have a wider neck than steel-string or electric instruments, which does not always suit everyone either (and as a result I won’t recommend a classical guitar for beginners as being easier). Electric guitars are not specialist instruments and do not require more experience to play than acoustic guitars. If you want to play electric guitar, there is no reason why you cannot start learning with an electric guitar. Just remember that electric guitars will require an amplifier, and that will demand a little extra from your budget too. Fortunately there a number of great small amplifiers on the market that include a headphone jack for near silent practicing, which is very useful in Paris! For many children younger than 12 years old, a full-size guitar may be too big and cumbersome to deal with. 3/4-size guitar is usually most appropriate, and a 1/2-size guitar may be best for children younger than 10. Sadly, many of the smaller bodied instruments on the market are poor quality which amplifies the frustrations of learning the guitar. Also note that I don’t usually teach children younger than 9 or 10 years old, click here for my reasons why. I do not advise buying a (new) guitar much cheaper than 150€. I very strongly advise against spending less than 100€ (in fact I might even decline to teach you on a very poor instrument, because it would be wasting your money). At the cheap end of the market quality control suffers and quality of the parts suffers too (tuners, bridge, pickups etc.). Cheap guitars are unlikely to be properly set up in the factory (if at all), their playability and tone can be awful and tuning the instrument can be more difficult (and that’s already a challenge for beginners). In short – the cheapest guitars can permanently kill someone’s enthusiasm for guitar and music. Some of those issues can be remedied but you will end up paying extra to a professional to do so and still have a lacklustre and uninspiring instrument. You may be wasting your money on the guitar and therefore your guitar lessons too. Fortunately, if you budget for €200, you can buy a nice guitar that will be adequately made, will sound good, and you’ll have money left over for an electronic tuner and a light soft case. If you think of in terms of the years or decades of pleasure that that guitar can give you, that 200€ on a guitar (and whatever you spend on guitar lessons) will be money very well spent. Of course if you have the money to spend and you are serious about playing, there is no reason for you to not to spend more money on a guitar. While it’s debatable whether a 400€ guitar is twice as good as a 200€ guitar, it may be a more inspiring instrument and get significantly more playing time. As the only path to progress on the guitar is with the instrument in your hands, that can only be a good thing. Obviously spending 2,000€ on a guitar as a beginner is difficult to justify, but I do know of many students who went a little over their budget on guitars they fell in love with in the store. They never regret the purchase. The major advantage of buying a new guitar from a store in Europe is that you will have automatically have a minimum of two-year warranty that will cover all manufacturing faults or flaws or damage during shipping, at no cost to you. If the guitar you want is in stock when you are ready to buy, it is the simplest, fastest, and safest option. When buying a used instrument, it is entirely possible to get more guitar for your money, i.e. higher quality, nicer finish and fittings, but obviously not in new condition, e.g. there may be scratches or dents in the finish and perhaps some tarnishing on the metal parts. With careful shopping these issues are only cosmetic and do not effect the sound or playability in any way. But if you are not experienced with guitars you could unwittingly be buying a lemon sold as a peach. Some of the guitar stores mentioned above will stock used instruments and they would be the best places to buy used guitars from. There are also general second-hand stores dotted around Paris (e.g. Cash Express) though the quality and condition of what you buy may very poor and some issues may not be immediately apparrent; buyer beware. Note that the law in France changed in 2015 to give a two year warranty to all sales from professional retailers, EVEN on used equipment! That warranty applies only to manufacturing faults. Six months after the purchase of used equipment the onus is on the client to prove the issue is due to a mnufacturing flault. None the less, I think that makes buying a used guitar (from a real guitar store) a less risky proposition for the beginner than it would otherwise have been. Acoustic guitars (steel or nylon string) – Look for guitars made by Yamaha, Cort, Takamine, and Lag. Electric guitars – Yamaha, Ibanez, Squier, and Cort. Amplifiers – Electric guitars also require an amplifier and that demands an extra budget. I would avoid the cheaper tiny practice amplifiers but there is a great selection available starting around 90€ – 100€. Many of my students use the Roland Cube/Micro Cube series, Fender Mustang series, or Vox Mini3, all priced at around 125€. They are fun, versatile, and compact and feature a headphone jack – ideal for small Paris apartments. For a little more money, I love my table-top-sized Yamaha THR5, which sounds fantastic, comes bundled with audio recording software and also doubles as an fantastic mp3 speaker. Note that all guitars will periodically need string changes and adjustments to the neck and/or bridge and to keep them in good playing condition. Used guitars should certainly get a once-over by a professional and even brand new guitars may need some need some initial TLC to get them in peak condition. Most luthiers and guitar technicians charge 50€ – 60€ per hour for this work, though a simple string change may only be 10 minutes plus the price of new strings. Also note that I offer my guitar tech services at reduced rates to my guitar students – see here for details. I have not used these people for my own instruments but they are highly recommended by my musician friends and students.